I’m deep into the Summer 2011 magazine, as is normal for this time of year, but between editing articles my mind is straying to Alumapalooza. It’s coming up in two months. We’ve sold out of trailer spaces on the field (the limit was 200) and the schedule is about 95% solidified, so at this point you’d think the major work would be done. But in fact there’s much more to do. We are still registering “walk-in” attendees, and there are a thousand small details to finalize. Brett and I will be very busy in the two months between now and May 31, 2011 when it all officially begins. The last couple of weeks before the event, we’ll head out from our respective locations (me in Arizona and Brett in Florida) heading for Ohio, like 200 other trailers that are coming from all corners of the country. I’ve been toying with the idea of organizing a caravan as many other people are doing, but because of the way we are going to travel I’ve conceded that it won’t work. Instead, I’m working on a concept of “virtual caravanning.” The idea is that many people who are traveling to Alumapalooza via differing routes can share their experiences through the Internet, both with fellow virtual caravanners and people who are unable to attend. As a small first step, I’ve set up a Twitter account called “airstreamlife” which I’ll use to post quick notes and photos from the road as we go. Fellow travelers can follow airstreamlife and we’ll follow you as you travel as well. Now, long-time readers of this blog will remember my rant some time back when I explained in excruciating detail why I have — to this point– avoided using Twitter and Facebook. But I’m not a total Luddite, just a highly critical adopter, and my perspective has changed. The iPhone has now given me a very useful mobile tool that integrates with Twitter. Now I can easily post photos with short notes from the road as we go. That’s a much more interesting form and reason for communication, to me, and so I’ll explore it a little. It’s an experiment. Still, this blog will remain the primary outlet for all things related to Airstream Life and our restless travels. In the next few days, we will be occupied with a few spring visitors. Erica is coming back today from Texas, with a Globe Trotter that she is delivering to a mutual acquaintance, and we are going to have a little driveway camping session to get the new owner up to speed. On Friday we are expecting another guest, and next week a third, so life is going to be more exciting than it has been thanks to the folks who are swinging through. More on that later. I’m starting to appreciate the feelings of people who have read my blogs for years, living vicariously through us and thinking about the next time they will get to break away for a road trip — because now I’m one of those people. Except for our trip at New Year’s to Anza-Borrego, we haven’t moved the Airstream since October. It’s not for lack of ideas. This was a planned pause, specifically so we could take care of things that could best be done while we were parked, but it is mostly behind us now. All of the routine medical exams are done, Emma’s orthodontics are on auto-pilot, Modernism Week 2011 is done, the Newbies book is done, Alumapalooza is about 90% set, and I can always work on the magazine from the road. So at this point we are under very little obligation to stay put in Tucson. It is springtime here, which means lots of days in the 70s and 80s, and believe it or not, plenty of pollen. I notice it somewhat, but Eleanor is virtually incapacitated, which is a drag anytime but especially tragic in the stunningly beautiful weather we get this time of year. We can’t go hiking up in the mountains to take in the spectacular views and desert blooms. Naturally, the idea has struck us to escape to some part of the country where pollen is less of an issue, and that has led to temptation of the sort that causes us to spend hours browsing maps and weather reports, and reading blogs of fellow travelers who are currently exploring. All kinds of places are suddenly appealing to me. It was about this time three years ago that we went to Bahia Kino in Sonora, MX and lazed around on the beach for four days. If things were a little quieter in Sonora right now I’d be inclined to revisit that trip, just for the chance to stroll a quiet sandy beach and listen to the waves at night. Or perhaps we could dash off to the foggy Redwood National Park in northern California, where the humpback whales are passing by in their annual migration. But really, we probably will stay put, with the exception of a quickie weekend here or there. It is not as interesting as traveling but I feel like we are earning credit somehow. There’s something to be said for maintaining continuity at least. This is the longest period we’ve been out of the Airstream since 2004, and I suppose it indicates that we are gradually learning how to be “normal” people. So far I’m not impressed with the perks of normalcy, but nonetheless we will stay and get our work done, save our pennies, and plan & dream. When we do finally get back on the road, it will feel like we’ve earned it. Once we do venture out, the trick will be making the planned trip — a long Interstate slog on roads we’ve seen several times before — into something more than just a 1,900 mile death march. Our primary purpose in May will be to get to Ohio for Alumapalooza 2011. That’s something we can do in four days if we press hard, seven days if we travel half-days, and two weeks if we do it in our classic “stop and smell the roses” style. I was initially not feeling very good about being on the road for a long period of time because I was concerned about work I needed to do, but that’s crazy. Since when is work the most important thing? I can clear the decks before we go and deal with the little things that pop up as needed, and maybe even take a few days off. Let’s make it a two week trip and really enjoy it. I might even use the “v-word” (vacation) but not too loudly because this is supposed to be a business trip. Speaking of which, I’ve been having some conversations with Marty Shenkman, a tax lawyer who is also behind RV4theCause.org. Marty uses his Airstream as a business tool, as I do, and both of us have some concerns about the correct way to deduct, document, and depreciate our travel trailers. We’re having a rather spirited debate, since he does it one way and I do it another way, and Marty’s CPA has joined in with his own thoughts on the subject. The key, of course, is finding a way to bulletproof ourselves against audit challenges, since an Airstream can be viewed both as a home and a business vehicle, and each can be handled differently from a tax standpoint. The outcome of this has been that Marty will be researching the subject further and presenting at Alumapalooza. His topic is going to be something like, “Making Your Airstream A Deductible Business Asset,” which I bet will appeal to all the folks who would like to work from the road. You can bet that I’ll be in the front row to hear what he has to say (and heckle him if needed). But I’m not mentioning this to push Alumapalooza. We’re basically sold out — just five spaces left as of today — and as far as I’m concerned, 195 trailers is plenty! My only wish at this point is that we don’t have the usual Jackson Center summer weather pattern, which includes chilly fog, rain, sun, intense heat, humidity, thunderstorms, and a chance of tornadoes all in the same day. Given the dramatic mood swings of the local weather, I suppose I should be impressed that 380 people are going to join us in that field next to the manufacturing plant. Brave souls, every one. So we are in the same boat as all the frozen northerners now. We’re at home, waiting for the moment when we can hitch up and head out, and in the meantime we are dreaming of what’s to come. For those of you in the north, hang in there–spring is coming. For those of you who are on the road right now, take a picture and update your blog for me. I’m not talking about Patagonia, the region of South America — although I’d like to explore that area someday too. We’ve got our own little Patagonia here in Arizona, a funky and stubborn village sitting just a few miles north of Mexico and adjacent to some of the best birding in the North America. Patagonia is one of those places that makes you wonder “Why is this town here?” There’s no industry and not a lot of tourism. It is about a one hour drive south of Tucson along scenic Route 83, which winds through foothills and between mountain ranges all the way down to Nogales. The secret of the town is the long park that forms a greenbelt between the commercial center of town and the highway; this is where the railroad used to run. Patagonia was once a mining town. Now it’s an enclave for eccentrics and people who want small town life in a warm climate. In 2006, when we were full-timing, we paused in Patagonia at the behest of our friends Charlie and Lynn, who winter there. The next year we bought the house in Tucson and so we’ve managed to drop in on Charlie & Lynn in Patagonia again every year. 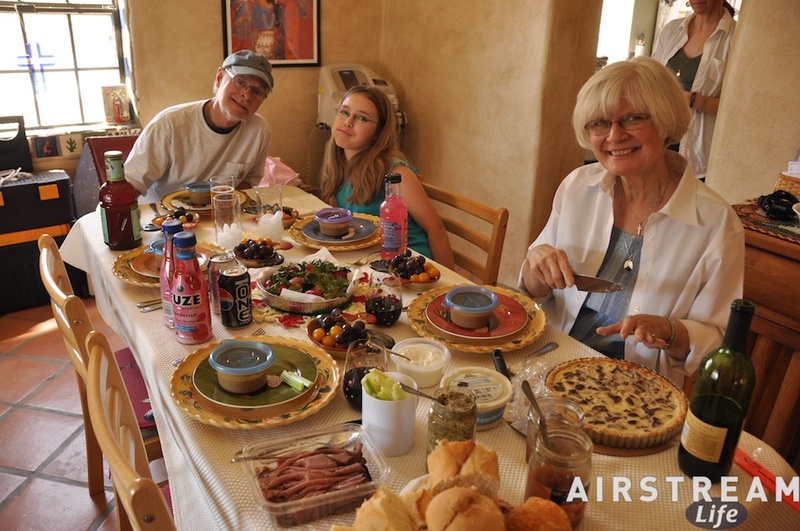 The centerpiece of this year’s visit was a picnic lunch orchestrated by Eleanor yesterday, served in the dining room of the little adobe casita that our friends rent. Since Charlie is a Mercedes enthusiast, and primarily responsible for my interest in the older cars, it was mandatory to take the 1984 Mercedes 300D down for the trip. It was a good choice anyway, as the sedan is a lovely cruising car for open and winding roads like Route 83, and the trunk was big enough for the two coolers and one large wicker picnic basket that Eleanor had packed. Of course, driving old cars is always a chancy game, and I have always known that there would come a day when a roadside repair would be needed. This was that day (perhaps the first of many). I’ve been running pure biodiesel in the car for a couple of months now, and biodiesel is an effective solvent, so it tends to loosen up all the old crud in the fuel tank. That means eventually the fuel filters will clog up. Sure enough, about eight miles into our trip I noticed a distinct lack of power on acceleration which felt exactly like fuel starvation. We put up with it for about 30 miles but finally I pulled over along a dusty stretch of Rt 82 near Sahuarita and with Eleanor’s help quickly swapped out the primary fuel filter for a fresh one. This is a simple job, involving merely loosening two hose clamps, removing the in-line filter, and then installing the new one. The filter was pretty dirty, but unfortunately this didn’t solve the issue. Along Rt 82 the road climbs to 5,000 feet of elevation, and the locals who traverse the road are not particularly patient with old cars that can’t break 40 MPH on the hills due to fuel problems. We got aggressively passed a lot more than we deserved. But all ended well, since I was also carrying a spare secondary fuel filter. With Charlie’s assistance after lunch, I swapped that filter out and the 300D was happily returned to its normal fire-breathing 120-horsepower self, capable of zero to sixty in a leisurely 14.5 seconds. OK, so that’s not really fast. At least now we could get to 60 MPH. Lunch, for those who are curious, consisted of a cold multi-bean soup with greek yogurt, mushroom-and-onion quiche, French baguette and croissants from the local bakery, Eleanor’s homemade apple butter, apricot preserves, artichoke antipasto, slices of roast beef, fresh giant strawberries, black grapes, yellow cherry tomatoes, celery sticks, baba ghanoush, and apple and strawberry pastry puffs for dessert. After all that, dinner was popcorn. It’s a good thing I like Patagonia, and the roads leading there, because I’ve got to go twice more in the next couple of weeks. I am expecting to be on call to assist a friend who is going to be acquiring his first Airstream, and I’ve got to lead a group of local car guys down for a day trip. This is a lot of driving but well worth it. Being mostly flat, southern Arizona is not as abundant in twisty & fun drives as the northeast, an aspect of life that I will admit I miss. The ride to P’gia is one of the good ones, and I recommend it to anyone who is down here to explore. I like caravanning. In our full-time travels we occasionally would link up with another Airstreamer and travel with them for a while. Our buddy Rich C was with us on and off for about four months. We also had a very memorable impromptu caravan from the International Rally in Salem OR, across Washington and Idaho to Montana with three other Airstreams, and a couple of years ago we organized a group of three Airstreams down to Bahia Honda in Sonora MX. My style of caravanning is pretty casual. Point to the destination, agree on a rough routing, and let everyone go at their own pace. On our northwestern caravan we found that everyone spread out quite a lot, so the only practical way to stay in touch was with cell phones. If someone wanted to meet up for lunch, they’d call and we’d compare notes on possible stopping points. There was never any obligation to stay with the group, because we wanted everyone to feel free and unencumbered. Whoever got to the destination first typically assumed responsibility for checking out a good campground and telling the rest of the group where to go. We agreed that if anyone got sidetracked or delayed, we wouldn’t hold up the group — they could just catch up later. In other words, not much structure and no rules other than the common conventions of good behavior. It worked, probably because of the sort of people we invited along: independent and confident Airstreamers with plenty of travel experience. Having done this a few times, I have been curious to see if the system would work for a larger group that wasn’t just friends who were well-known to us. We’re going to be heading out of Arizona sometime in mid-May to work our way up to Alumapalooza, and that trip seemed to present a fine opportunity to collect a bunch of hardy Airstreamers for an experimental caravan/adventure. Still, we might cross paths with a friend or two along the route. We don’t usually nail down our exact route in advance, preferring to leave some room for spontaneity, so I think the best way to manage this is to try a real-time Internet solution. I’m considering various methods to post our current location and immediate next destination in a semi-private location, so that a group of friends who we’ve already organized can be updated on a daily basis and share their plans with us at the same time. I noticed at the Modernism Week show that virtually everyone was sporting an iPhone. I am a relative Luddite in that regard, having held onto the philosophy that phones are meant to be phones. I like them to be small, durable, easy to use, and long-lasting, a test which most more “advanced” devices have failed miserably since the first so-called smartphones were introduced in the 1990s. But I could no longer deny that the iPhone (and probably a few other similar phones) has finally achieved at least a halfway decent compromise. Instead of just packing stupid & gratuitous features onto a phone, it represents a decent advance in technology with a feature set that actually adds value to the basic audio-only phone. It only took about fifteen years from the first tentative steps that I watched as a wireless industry analyst in the mid-1990s. I actually don’t care about most of the things that an iPhone can do, but I do see where instant and easy communications via an Internet-capable phone and some sort of coordinating service “in the cloud” (meaning on the Internet) could be a really useful way to coordinate a group of roaming travelers. We could post our route maps, share real-time updates from the road including photos, coordinate meeting points, ask for help, and generally just play the social-network game to while away the miles. So perhaps I’ll finally break down and get an iPhone next month. Verizon owes me one more “New every two” upgrade anyway, for whatever that’s worth. The real problem with better communication technology is reining it in. Only the social mores and respectfulness of people hold back what often becomes a deluge of useless information. I am already reachable by email, phone, voicemail, website contact form, fax, Google Buzz, and AOL Instant Messenger. I have steered clear of Twitter & Facebook in part because I can’t handle any more. A smart phone means the darned thing knows how to bug me with information I’d often rather not have, in places I’d rather not receive it. I’m not a believer that having more tech on your hip automatically makes you more productive. So I’m going to program it to be rather selective about what it tells me. But having said that, there might be a fun road-geek experience coming up. The other issue with caravanning to Alumapalooza is simply that I have to get there a few days early for setup, and I can’t bring a group of people with me — there’s no place for them to stay! That’s easily resolved by having the group break off to some attraction in the area. There are many things to do near Jackson Center, as well in nearby Indiana, Michigan, and Kentucky. I’ll be envious of them, while we are stuffing goody bags in the humidity, staking out campsites, etc. Perhaps caravanning will evolve to an entirely different sort of experience in the future. The social and safety aspects of traveling in a group can stay, using modern communications to allow people to share their experiences and collective knowledge while maintaining their independence. The new generation of Airstreamers seems to want that. Already I’ve seen groups traveling like that, not calling themselves “caravans,” but instead inventing a new set of guidelines and tools to enable a vibrant and social experience nonetheless. Hmmm…I’ll keep thinking about it. When you ask, “How are things?” some people respond after measuring how much stability they’ve had in their lives lately. If things have been predictable, safe, and settled, they say, “Not bad” or something to that effect. Another group of people disregard the predictable and measure the “delta” — in other words, how much things have changed in their lives lately. They say, “Not bad” if life has been interesting, challenging, or if they have some sort of new & different project going on. My friends tend to be mostly this type. It’s not because of any conscious choice, it’s just that I like things to change and there is often a mutual attraction between people who like to mix it up a little from time to time. When things are happening, I’ve got stuff to blog about, and when things are not happening I start thinking about going somewhere to find something new. The recent dry spell in this blog tells you that either (a) not much is happening in my life, or (b) things are happening that I just can’t talk about. I’ll give you a hint: it’s not (a). Life continues to be interesting, but in a sort of home-bound soap opera way instead of fun travel stories that make readable public blog fodder. I have often thought that I should offer a “subscription” blog with the really juicy stuff, but upon reflection I’ve decided you probably don’t want to read it. Whatever you are imagining right now is probably about as interesting as the reality anyway. What’s left after the X-, R-, and even PG-13 stuff is removed is fairly safe, so you can continue to read this blog without concern for your innocent children. 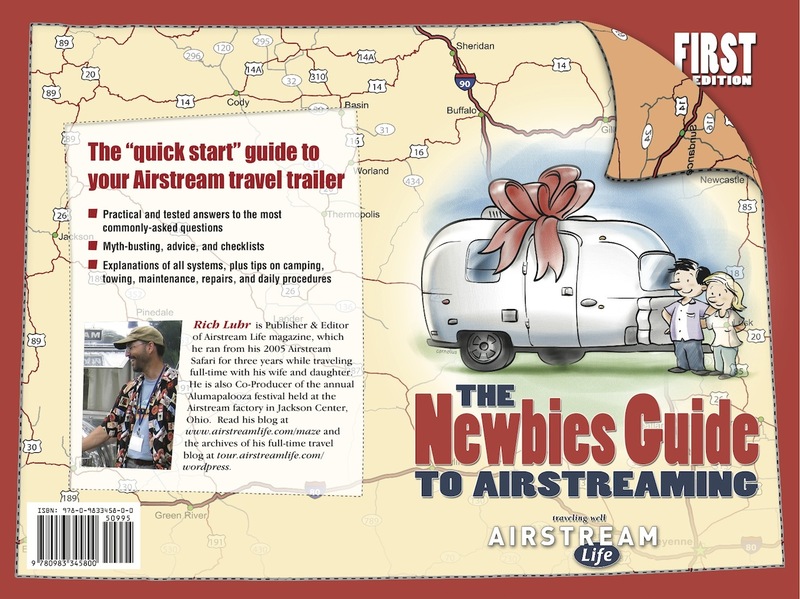 The biggest news is that as of today my new book, “The Newbies Guide to Airstreaming” is officially complete and off to the printer. Wow, that was a lot of work. It should be ready for distribution sometime in April, but if you have a Kindle you should be able to download and read it by Monday, March 21. I’m also working on an edition for iPad, iPhone, and iPod Touch and hope to have that ready in a week or two, if Apple cooperates. 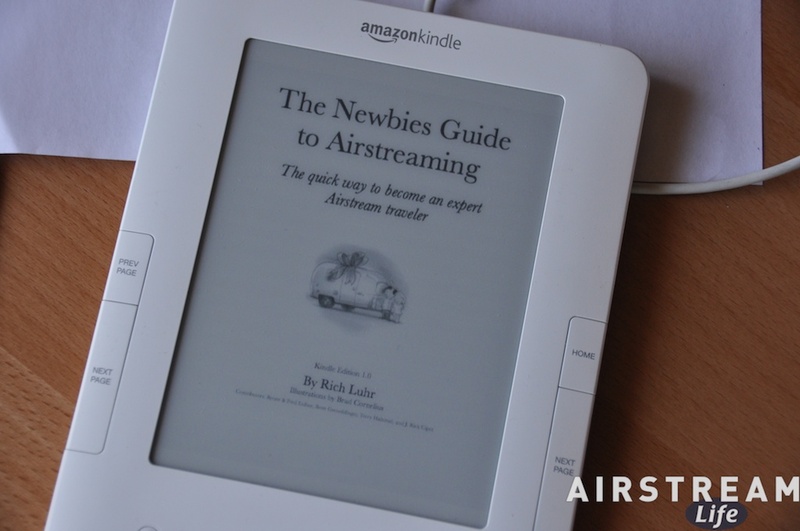 The folks at Airstream have read preview copies and they seem to like it. They tell me they will include a copy with every new Airstream, which I hope helps smooth the way into our community for lots of people. Getting feedback from reader for a revised second edition should be interesting, but I’m looking forward more to the chance to start work on the next book, which will be completely different. I don’t know for sure what I’m going to say, but I do have a general idea of the theme, and I’ll talk about that more in a future blog. Getting going on that project is something I’m looking forward to doing this summer. Lately I find myself in the role of Airstream advisor to many people. I don’t know how I got this job, but I’m a sucker for it. I never seem to be able to say No, even when things are fantastically busy. It’s probably because I meet the most interesting people this way. In the past few weeks I have been approached by a well-known author, and a semi-famous soap opera actor, both of whom have found themselves needing an Airstream for very specific purposes. There have been several other folks as well. I wish I had a fleet of Airstream to sell and/or lend out, but I don’t have the time or space, so instead I’ve been just offering advice and directing them to people who can help. Finding “just the right one” is a time-consuming process, like finding the ideal mate. Ye gods, I’ve become a matchmaker. Call me Shadchen. The other major activity in life has been to finalize Alumapalooza. There’s another labor of love. I am truly glad that we are approaching our limit of 200 trailers (we have just 8 spaces left as of today). It has been a fun process to try to make APZ 2011 better than the original, but also a bit exhausting. At this point I’m not even trying to sell the last few spaces — I’m sure they will sell themselves soon enough. The entertainment is arranged, the speakers are about 80% set, we’ve got the tents, catering, signs, t-shirts, A/V setup, tiki torches, door prizes, mud boots (whoops, forget I mentioned that last one) … you name it, we’ve got it. There are only about two dozen things left to do before I can comfortably say that the job is done … and by then I’m sure it will be time to head off to Ohio. A lot of people have asked me what we plan to do to deal with higher fuel prices this summer. I tend to just shrug. We can’t make our rig significantly more fuel efficient than already is, and we already tow at a fairly moderate 62 MPH (except in west Texas). If I need to spend less on fuel, we delete miles — simple as that. Two years ago, when we were facing $5/gallon gasoline in remote parts of Utah, we simply spent more time at each stop and towed no more than 70 miles per travel day. This year we have to go to Vermont and I can’t make Vermont come any closer, so the only fix is to optimize the routing as best we can. If things work out well, we’ll be traveling with or meeting friends at various points of the trip, and that will probably make the fuel prices seem less painful, as the bigger significance of having fun and adventures becomes apparent. As I’ve said many times, it’s not about the towing — it’s about the stopping. A trip to the northeast will cost about $700-800 in fuel each way, but it’s still a bargain. We’ll be out for nearly a month, visiting at least ten states. I’m not going to complain about the extra $300 or so it costs for an experience like that. It’s “delta-making” stuff; the stuff I thrive on, and the reason we own that big shiny thing in the carport. They’ll have to raise the price quite a lot before I decide to stay home.